The Cutting Edge of Ordinary: Creamy Crunchy Baked Leeks and a Giveaway! 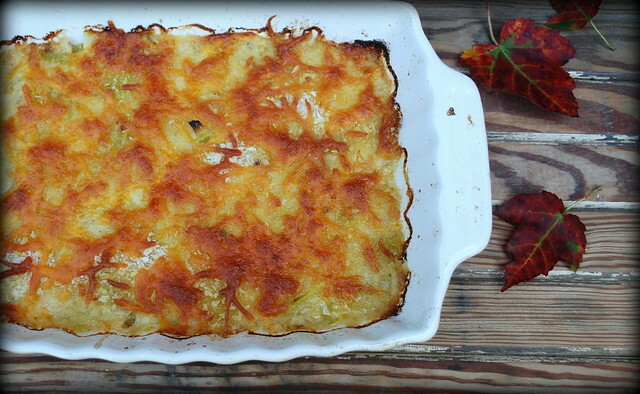 Creamy Crunchy Baked Leeks and a Giveaway! I was asked by TLC Book Tours to review Jamie Oliver's new cookbook Great Britian. First off let me say, if I ever had a cookbook published, it would so much like Jamies. I love that it's loaded with photos and the whole style is very unpretentious. It just flowy and fun. Just like his cooking. The recipes are authentic British foods and in most of the recipes you get a nice little history lesson to boot. "rosemary and pork are best mates"
"apples and brown sugar are best mates"
"avocados and lime are best mates"
You get the picture. I also love how he always says "brillant". Most of the Brits do and it just tickles me to know end. My maternal great grandmother was English so I'd like to think there are some recipes in this book that she might have grown up eating. There are a few that I had never heard of like......St Clement's Cake, Cranachan, Welsh Cakes, Arbroath Smokies, etc. So I poured over all the recipes in this book and I had it narrowed down to two recipes. This one for Creamy Crunchy Baked Leeks and his Jammy Coconut Sponge Cake. As luck would have it, my friend Amy at Very Culinary made the cake. You should go check it out! Click here! Amy and I always seem to be on the same wave length when it comes to food so I'm a little surprised that we both didn't post the same recipe. I'm a leek lover. Caramlized leeks just send me over the top. 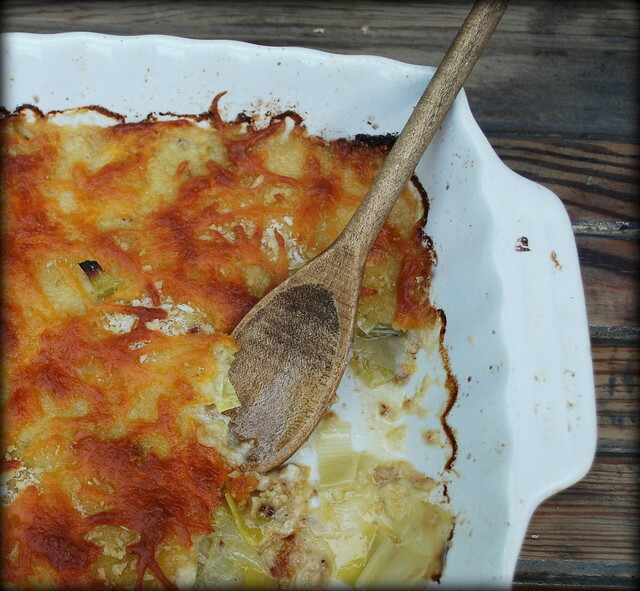 Leeks baked with cheese. I can't even speak. This recipe was every bit as delciious as I expected it to be. 1.7 ounces cheddar or any delicious cheese crumbled. Small bunch of fresh thyme, leaves picked. Put a medium sized pan on medium heat. Put the bacon, the oil and the bay leaf into the pan and fry for a few minutes until lightly golden. While that’s happening top and tail the leeks (cut off the bottom and the dark green tops), cut in half lengthwise and wash well. Slice them into 1 inch pieces and add them to the pan. Stir together, season generously with salt and pepper then pour the stock and cream in and bring ot a boil. Simmer for about 10 minutes. At this point turn off the heat and stir in most of the cheese. The mixture will still be quite runny at this point but don’t worry; it will thicken up in the oven. Meanwhile, put the garlic and the bread into a food processor with the thyme leaves and pulse until you have nice coarse flavored breadcrumbs. If your pan is ovenproof you can simply pop it straight into the oven, if not, place into a shallow 8x10 inch pan. Sprinkle with breadcrumbs and cheese. Cook on the top shelf for 30 to 40 minutes or until golden and crispy. Serve with absolutely anything you like. Leave a comment answering this question: What's the last thing you ate? One lucky U.S. or Canadian reader has a chance to win a copy of Jamie Oliver’s Great Britain. If you don't have a blog, please leave me email address to contact you! There are three ways to enter: (1) leave a comment on the blog (2) go “like” The Cutting Edge of Ordinary on Facebook or (3) Already a fan? Just leave a comment on The Wall. Want to increase your chances? You can leave a comment here and on Facebook. Giveaway ends on Friday November 2 at midnight EST. Good Luck! The last thing I ate: homemade mango ice cream last evening. Breakfast this morning: an orange, a banana and a boiled egg. Would rather have cheesy leeks! The last thing I ate was a piece of toast and some yogurt. "best mates"..."brilliant"... right? I love him, too. Totally my style. I remember flipping through the book and hesitating when I got the coconut cake, thinking "Lisa will probably make this." It is funny (and almost shocking) that we didn't post the same recipe. I am completely on board with your choice. Luuuuhuv leeks. Be safe today! Thinking about you. Whoa my fingers are crossed! The last thing I ate was my friend Cathy's vegetable barley soup. I feel so virtuous I'm off in search of pastry! I had some potato soup. Made a crock of soup in anticipation of no electricity thanks to Hurricane Sandy. Still have power, but leaving the crock on. mmm that recipe looks delicious! The last thing I ate was an apple. I just finished up some basil pesto on Texas-shaped pasta with a spritz of fresh lemon. Mmmm! Last thing I ate was Crawfish Soup :) No need to enter me in the Giveaway as I already own this cookbook :) One of the best I've seen this year! The last thing i ate was salmon, mushrooms and leeks in phyllo. YUM! OOooo that looks so good! Gonna go get me some leeks - LOL! We had tacos, cheesy salsa rice and refried beans. I'm also looking forward to a Durian ice pop as a snack! The last thing I ate was grilled halibut with brown rice, brocolli and baked winter squash for dessert. Dinner last night was grilled steak and asparagus with mashed potatoes. Ha! The last thing I ate was also Beef Stroganoff! Though Nana-Bob and I are not in the same house :) Mine was a garlicky beef stroganoff made in the slow cooker and man was it tasty! Course I work from home and had to smell it cooking all day. Torture! I made my special oatmeal this morning: organic oats cooked with soymilk, with chopped up apple and raisins, sprinkled with ground flaxseed and cinnamon. I topped it with a dollop of Greek style organic yogurt. It's delicious and filling! THANKS FOR HOSTING THIS GREAT GIVEAWAY!!! Last thing I ate...Southwest egg rolls from Chilis...mmmm good! The last thing I ate? Joy the Baker's Caramelized Mushrooms and Biscuits. I liked the Cutting Edge of Ordinary on Facebook. The last thing I ate was a lovely home cooked dinner of pan-fried salmon, arugula/rocket salad and sauteed mixed mushrooms. I would love to win the Jamie book as a gift for my daughter who is at university in the States. Leeks and I are best mates! Ha! I love leeks. Love them! I also love Jamie Oliver. The last thing I ate was grilled cornbread and some oatmeal. Breakfast. I liked your page, which I can't believe I hadn't already. Gigi. I made penne pasta with braised short ribs! I would love to add this book to my cookbook collection. A bagel - finally found one here in New York! I liked your page a long time ago! The last thing I ate was sweet potato, the way I like it best: cooked and mashed. Keepeth thine brown sugar and marshmallows away! Chicken korma. It wasn't that good. Oh I love leeks. I never hear of anyone eating them in the US. I only started eating them when I moved to Europe. They are a staple here. I am going to try this. The last thing I ate was my lunch...a piece of whole brown bread with a little butter, cheese and slice of ham. That recipe looks AMAZING - wish I was there to share it with you! Just had a slice of Chai Banana Bread, need to make more. Candy corn! Oh you mean real food? Tuna Sandwich with red onion and dill pickles chopped in. BBQ chips on the side. Typical Saturday lunch! Beautifully done! This looks so comforting and flavorful. The last thing I ate... does the umpteen fistfuls of Kettle Korn that I'm still chewing on, count? Last thing I ate was a Pepperidge Farm distinctive Milano cookie...one of the limited edition peppermint ones. The last thing I ate was cinnamon chip oatmeal cookies that my sister sent me, with my morning cup of coffee. don't know if i've already signed up but will do so again so i might be a lucky winner. i love jamie oliver. Pasta Carbonara, for dinner tonight. Not from Jamie's cookbook though. I prepared the Early Autumn Cornish Pasties and they were terrific. My British husband said they were just right. I thought this was a great cookbook and have several other recipes marked to try. Great review. Banana pancakes fortified with wheat germ and slice of ham.